Voyages of Rediscovery- Educational Expeditions: Free Canoe Trips- In the Rain! 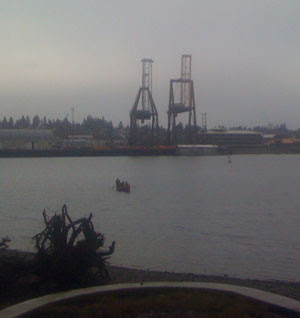 We had a great paddle yesterday on the tranquil yet rainy waters of Budd Bay. We put our sign "Free Canoe Trips" and the paddlers showed up! We went on 5 different canoe trips yesterday and took out 36 paddlers! The whole idea of the day was to get the word our about Voyages and take community members out on the water for free! Thank you for coming out and thanks to all who donated, including the gas money and food!